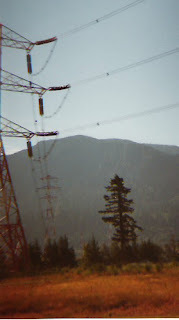 Image: power line near Bonneville Dam. Governor Gregoire has signed an executive order called "Washington Climate Change Challenge." Someday they might come up with a better name. Basically this challenge means "rolling back greenhouse gas emissions to 1990 levels by the year 2020." Good idea, but a hard step to take due to population growth. Yes, population growth is a big factor. Most Northwest electricity used to be "non greenhouse gas emitting" hydro-power. We've built just about all the dams we can, but our population and economy keeps growing. hydro-electric sources keeps dropping. It's been dropping for years. New people means having to get power from new sources. If we can't build anymore dams, "new sources" has been natural gas, coal and nuclear. That is in the past at least. Hopefully we can also be adding some new power from green energy sources such as wind and solar.